Paul’s plastering and artexing services are regularly employed around Fareham, Wallington, Funtley, Titchfield and further a field in areas such as Park Gate, Locks Heath, Portchester, Boarhunt, Sarisbury, Whiteley and Bursledon. Paul’s plastering and artexing services are regularly employed around Gosport, Bridgemary, Lee-on-Solent, Hardway, Rowner and further a field in areas such as Stubbington and Hill Head. Paul’s plastering and artexing services are regularly employed around Portsmouth, North End, Copnor, Southsea, Eastney, Hilsea and further a field in areas such as Cosham, Farlington, Drayton and Paulsgrove. 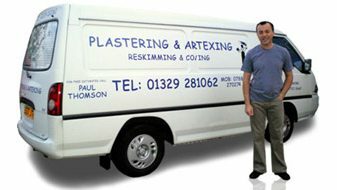 Paul’s plastering and artexing services are regularly employed around Southampton, Hedge End, West End, Swaythling, Rownhams, Nursling, Hillyfields, Shirley, Portswood, Bitterne, Sholing and further a field in areas such as Botley, Netley, Bishopstoke, Bassett, Chilworth and Totton. For more information about Paul and his plastering and other services, please browse this website and do not hesitate to contact Paul if you need any further information.